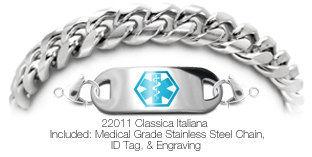 Fastest way to warn about diabetes is to have an ID bracelet on your wrist because EMT's want all critical information now. They look at your wrists first. 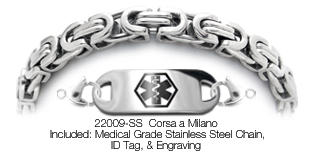 Paramedics are trained to look on wrists first for an ID tag and critical info. Paramedics want it all. And they want it now. Only medical bracelets work this fast. No time to make phone calls or wait for cellular operators to find and relay your medical history. It's now or never! Use numbers to avoid emergency errors: DIABETES 1 or DIABETES 2—All worldwide Diabetes Organizations recommend using Arabic Numbers instead of Roman Numerals for "type" categories to avoid serious mistakes. Don’t forget: Include other serious medical conditions and meds. Go to the American Diabetes Association to get all of your questions answered. 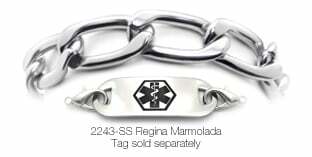 To buy a diabetic ID bracelet through the ADA and have Medical ID Fashions contribute directly for all products purchased, please go to Shop Diabetes Store and select the Medical ID Fashions ad for over 600 bracelet styles—the most complete line of diabetic bracelets anywhere. The ADA thanks you for your support. Please go to Diabetes-ADA on this website for how Medical ID Fashions works hand-in-hand with the ADA to help diabetes patients all over the world. • Centers for Disease Control and Prevention. 2014 National Diabetes Statistics Report: Estimates of Diabetes and Its Burden in the United States. Fact Sheet, Atlanta: US Department of Health and Human Services, 2014. You can be confused, have slurred speech, lose consciousness and have lack of coordination—all without any warning. 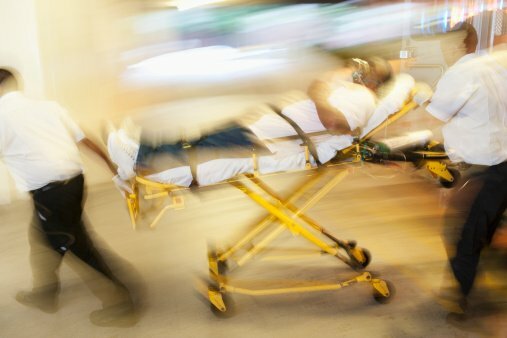 First responders need to know what to do, and police need to take you to a hospital instead of jail when you appear to be drunk. 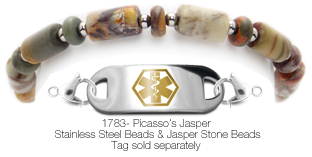 If unconscious your medical bracelet will speak for you because paramedics only have seconds to make critical decisions. Don't forget other conditions such as allergies, pacemaker, heart conditions, kidney failure and more—and all critical medications you're taking. Don't rely on wallet cards or phones. In car accidents a wallet and phone could be lost or broken. 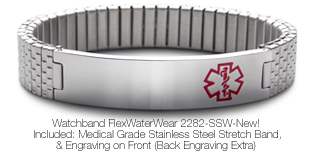 A firmly attached medical bracelet is the only thing you can count on. As an umbrella term, Diabetes mellitus covers a group of diseases that affect the way the body breaks down or metabolizes glucose—a major source of energy for muscles, tissues, and the brain. Type 1 Diabetes – You may have heard type 1 called juvenile diabetes or insulin dependent diabetes in the past, but regardless of what it is called, it is all the same disease. It is typically diagnosed in children, but there is a possibility of late-onset type 1 in adults. Pancreas makes little or no insulin. This is a result of an unknown genetic malformation. The body’s own immune system mistakes insulin-producing cells in the pancreas as being harmful and destroys them. It is known as an autoimmune disorder. Without these cells, the body cannot produce insulin to balance its blood sugar which forces people with Type 1 Diabetes to remain on insulin for life. There is not yet a cure, but with careful blood sugar management, they can expect to live longer than ever before. Types 2 Diabetes – Also called adult-onset or noninsulin dependent diabetes, this form of DM is chronic but can be eliminated by proper diet and exercise. It is unclear why, but the bodies of people with type 2 learn to resist the absorption of insulin. Irregular absorption of insulin causes glucose levels to skyrocket, and it becomes unmanageable without proper treatment. Poor lifestyle choices such as gaining excess weight, poor diet, and sedentary activity levels put one at an increased risk for developing Type 2 Diabetes, although, the exact connection between these factors and the inability to absorb insulin remains unclear. Severe cases of Type 2 Diabetes will require insulin therapy and careful monitoring of blood sugar levels while if caught early enough, a change in lifestyle can be the only medication needed. This is the most common type of diabetes in the United States, affecting more than 29 million Americans. Many doctors to become well-versed in treatment plans and options though, giving those afflicted with Type 2 Diabetes a great chance of living through and getting past their condition. (Mayo Clinic Staff 2014). 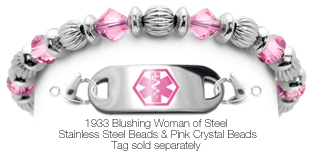 With over 600 styles to choose from, you no longer need to be embarrassed with an ugly diabetic medical bracelet. Choose from elegant beads, to Gold and Silver chains to stylish stainless steel. 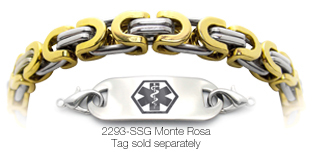 Now you'll be proud to wear a fashionable medical bracelet that no longer looks like something your dog would wear. Need more help selecting the right custom style, how to size, and organize medical info: See Beginners Guide Overview and Custom Sizing. Diabetes type 1 and 2 are chronic illnesses, likely to produce medical emergencies as the disease progresses over a lifetime. The underlying issue that triggers each type creates different variables in each condition. The factor differentiating Type 1 and Type 2 Diabetes is the genetic variant of Type 1 that causes the pancreas to not produce enough insulin. There's not yet a cure or prevention method identified, but usually it can be managed by a vigilant watch on blood sugar. Unfortunately, this does not eliminate the likelihood of complications—making it more crucial to have a medical ID from the beginning. Complications that cause a medical emergency. Diabetic ketoacidosis (DKA). Most common for individuals with type 1 diabetes, DKA occurs when your body produces high levels of blood acids called ketones due to the body breaking down fat as fuel. It can lead to loss of consciousness and brain swelling if blood sugar levels are adjusted too quickly. Nerve damage or diabetic neuropathy (DN). The excess sugar in the bloodstream, well-managed or not, injures the walls of tiny blood vessels called capillaries. These vessels are primarily responsible for carrying blood to one’s extremities and when damaged, loss of sensation or a burning sensation can begin at the finger tips and toes and spread upward. In advanced cases, it can cause a loss of a limb(s) and a decreased awareness of low blood sugar. Kidney damage or nephropathy. The kidneys contain millions of nephrons which filter waste from the blood, and diabetes can upset this vital system similar to the way it affects capillaries—with uncontrolled or long-term ill-managed blood sugar. The destruction of nephrons can result in sudden kidney failure (ARF) or end-stage kidney disease (ESRD) both of which can produce sudden onset, and life-threatening, symptoms (Mayo Clinic Staff 2014). This type of diabetes is primarily a result of lifestyle choices, and it causes the pancreas to either become resistant to or to stop producing enough insulin. Researchers are unsure as to why this occurs although, excess weight, a sedentary lifestyle, and genetics all contribute to development of type 2 diabetes. All complications for type 1, except for DKA, are likely to arise in type 2 patients. The issues of weight and activity level though, make certain complications more steadfast in type 2 than in type 1. Complications that warrant a medical emergency are as follows: Heart and blood vessel disease. The stress placed on one’s major organs from type 2 can manifest as cardiovascular problems over time such as coronary artery disease (CAD), heart attack or myocardial infarction (MI), stroke, narrowing of the arteries (ATHERO), or high blood pressure (HTN). Increased weight and inactivity are major components that contribute to the development of these conditions independent of a diabetes diagnosis. When coupled with a type 2 diagnosis, the severity of these various cardiovascular diseases is only exacerbated.